My husband grew up in the land of processed picnic foods drenched in mayonnaise and I grew up rather ignorant of them, so it is a constant struggle in our house for me to recreate these foods in a way that big Fred can tolerate. This is my "healthy" version of macaroni salad. I made it with whole wheat pasta, but I'm sure it would be delish with white or even brown rice pasta for a gluten-free option. I think the next time I make it, I will add chopped hard-boiled eggs. Cook macaroni according to directions. Rinse in cold water. Drain well and allow to cool. 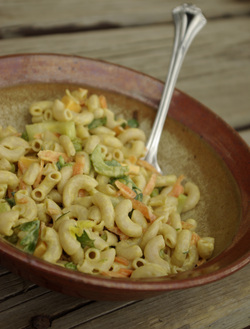 In large mixing bowl, combine macaroni, veggies, and cheese (if using). In small mixing bowl, combine last five ingredients, stir until smooth. Add sauce to macaroni mixture and serve!